Jack was Ben’s first real friend. When Ben was born, Jack was already two years old, with the sweetest temperament, the most beautiful gingery hair (much like Ben’s) and an instant protective love for Ben. Jack slept in Ben’s crib along side of him, played for hours on end with the mobile hanging from the ceiling and stared intently at the fake fish tank that was suctioned onto Ben’s crib. When Ben was in our arms, Jack was right next to him, taking part in the love and cuddles. For the first 4 or 5 years of Ben’s life, Jack rarely left Ben’s side – Jack loved watching Ben play with his interactive toys or watch fast moving DVD’s with colors, motion and cars. 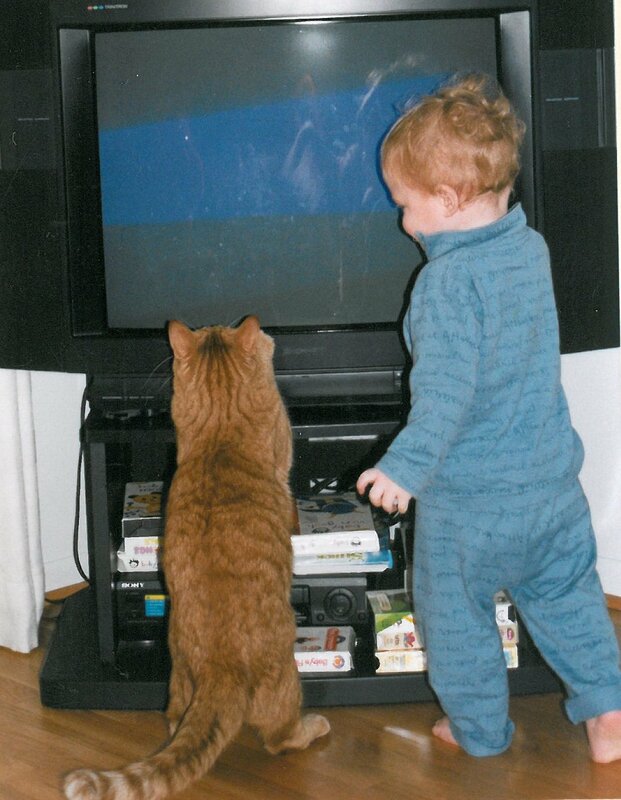 We loved when he got right up to the TV screen and tried to chase whatever motion caught his beautiful green eyes. Ben happily shared his food with him and Jack loved it all – especially what was left in the Rice Krispies bowl each morning. As the years passed and Ben got older, Jack gave Ben his space. But every single night – like clockwork as Ben was getting ready for bed, Jack would show up in his room to hang out and cuddle until Ben fell asleep. 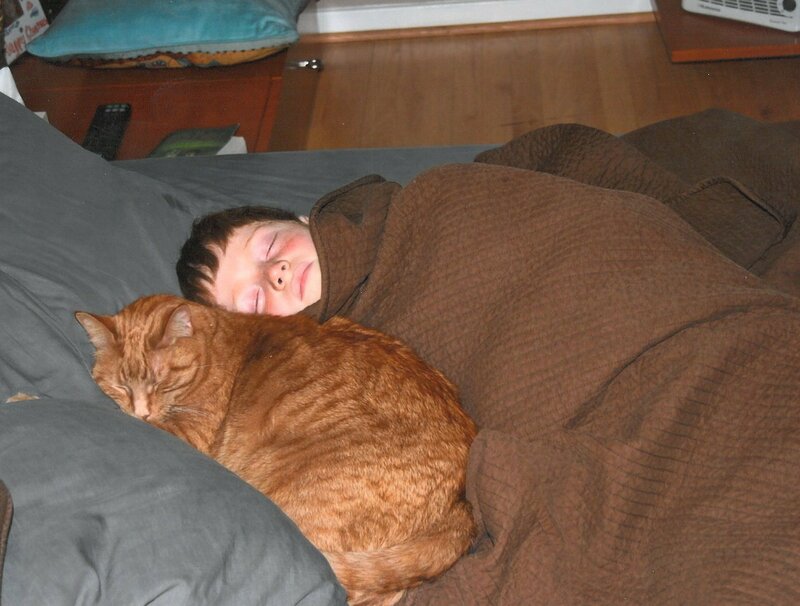 Jack, up until this past Saturday, was my precious, gentle orange tabby. Gary and I were lucky enough to adopt him when he was a year old. What a gift. When he came into our lives, he joined our beautiful dog Winnie and our incredibly cool and feisty cat, Zippity (both of blessed memory). When Ben was about 4 months old, we noticed that Jack was getting thinner. We attributed his weight loss to the new baby in the house, despite our efforts to introduce all of our pets to Ben properly and with lots of love and attention. But when others mentioned Jack’s weight, we took him to our fabulous vet and discovered that he so loved the soy milk from Ben’s bottle that he ate the tip and it lodged in his tummy, making it impossible for him to take food in. Surgery followed and we were vigilant about keeping the bottles capped at all times. However, it happened again during a too-drowsy middle of the night feeding – another costly surgery. And when Jack realized there would never be an uncapped bottle in our house again, he then ate the tip off of a pacifier! Yet another surgery – and Ben was suddenly off his pacifiers for good. But Jackie was young and otherwise healthy, so we got him through those couple of months and he spent the rest of his life sweet and happy. Along the way, we said our sad good-byes to Winnie and Zippity and welcomed new furry friends into our home – our dogs, first Brody, who is no longer with us, then Lucky, Rusty and Gus and later – the shy and timid, semi-feral cat, Harry. Last week, after months of trying to figure out why Jack had again become so sick and thin, our worst fears were confirmed – he had masses throughout his small and large intestines and pancreas. My poor Jackie was suffering and we had to make the painful decision that so many of us are faced with at some point…we would say good-bye to Jack the next day. We explained the necessity and the process to Ben and asked him if he would like to be with Jack and with us. Although we have lost a few pets during his 13 years, he has always been able to say good-bye at home, while, Gary and I have taken our pets in and held them through their euthanasia. Ben wanted some time to think about it. During Jack’s last 24 hours, we loved on him, fed him his favorite foods, thanked him for being the most loving boy ever and braced ourselves. Early Saturday morning, I listened as Ben went to the laundry room where Jack was resting and talked softly, petted and even sang to him. He stayed quite a while. It both broke my heart and confirmed what kind of thoughtful, loving person my son was turning out to be (even if it was reserved only for these sorts of occasions). And just a little while later, Ben decided to accompany us as we wrapped Jack in our arms took him in to see our incredible vet, who took a ton of time talking with Ben and explaining the process. I read somewhere that every time you have to say good-bye to a pet, they take a piece of your heart with them. And that every time you welcome another pet into your life, they bring a little piece of your heart back. I love that thought. My sweet Jackie – Ben’s first real friend. beautiful tribute to a loving cat. Beautifully done, friend. It’s coming up on a year since we lost Kobe and I miss him everyday. Hugs to you and to Ben. One day I will have to face that loss too. There is nothing like the love of a pet. They fill our hearts with pure joy. So, so sorry for the loss, but you will meet again! Tears are flowing, so glad I waited for a week to read this! Thought and love! So sorry for your loss. Our pets are such a huge part of our families and it is so hard to lose them. I lost my first best friend, our Airedale Terrier, when I was Ben’s age. I’ll never forgot the love and joy she brought to me and all of the other wonderful pets I’ve had along the way. Sending hugs!